Process rigid photopolymer materials in this mini exposing and drying unit. Designed specifically for processing metal backed photopolymer plates to be used in hot foil stamping applications. Maximum exposure area is 4" x 8". 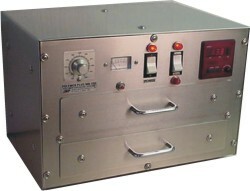 The upper exposure drawer features a unique glass-over-foam locking assembly for exposure of negative film and photopolymer plates. Four 15-watt ultraviolet lamps powered by self-starting ballasts provide plenty of exposing power. Cycle time is controlled by an electronic digital timer. The lower drawer houses a 400 watt convection oven for drying a plate after washing by hand. Temperature is maintained by use of an electronic microprocessor temperature controller. Both drawers ride on ball-bearing drawer slides for smooth operation. Modular construction facilitates repair and replacement of parts should that ever become necessary. Designed and built in USA. Click here for more information on the MB-100 System! Make your own hot stamping dies! For Making Elegant Foil Imprints on Almost Any Surface!